UPDATE: Lucasbooks has confirmed the cancellation to Knights’ Archive. Knights’ Archive spotted that the new Essential Characters is now listed as canceled by Edelweiss. We last heard that the book was posponed to 2016; it’s possible this is actually just another posponement, pending decisons regarding Episode VII and other new film content. (Perhaps the 2035 date is just intended to keep it out of other systems.) I doubt we’ve seen the last of Star Wars character guides! Edelweiss is a site that publishes electronic versions of publisher book catalogs: We have no reason to believe these changes don’t come from Random House. Lots of Leia. Lots of goodies are coming up on the Razor’s Edge blog tour. There are Martha Wells interviews at Fiction State of Mind and TFN and, with excerpt, on the Her Universe Facebook. Plus another excerpt from Star Wars Books and on Suvudu, an interview with White Hot Room’s Bria about her Razor’s Edge Leia costume. Upcoming. Has the new Essential Characters been pushed back to 2016? It looks like it, from what Knights’ Archive has discovered. Making room for Episode VII characters? They also spotted the first Rebels tie-ins, which are coming in August 2014 from Disney Press. Kenobi. John Jackson Miller got some pixels at Publisher’s Weekly upon the occasion of Kenobi being a bestseller; He’ll be chatting with Star Wars Books next Wednesday. In the meantime, there’s a new interview at Knights Archive. Review. James thinks Star Wars #9 has good revelations for Vader and Leia, but only meh on Han’s part. Street dates. We got the cover and now Empire and Rebellion: Razor’s Edge – the Leia novel by Martha Wells – has moved up from October 15 to October 1. It’s been a while since we’ve heard anything about The Essential Characters, but it’s popped up in Random House’s Edelweiss catalog with a brand new far-off date of October 7, 2014. Will it stick? Probably not! (We’ll see.) Pencil it in. Out now. Dawn of the Jedi: Into the Void came out almost a week ago, and author Tim Lebbon has been making the interview rounds with Suvudu, Jedi News, Star Wars Action News and Roqoo Depot. Meanwhile, there are reviews at Tosche Station, Fangirl, Jedi News, Knights Archive (x2) and Roqoo Depot. The blogside. Tor’s Emily Asher-Perrin has a list of what Episode VII could lift from the Expanded Universe. I haven’t covered a ton of these sorts of posts, but hey, it’s Tor and she made Mara #1, so. And speaking of… Bria has reached Legacy of the Force. Audiobooks. Timothy Zahn’s Allegiance and the Hand of Thrawn duology (Specter of the Past and Vision of the Future) are coming as unabridged audiobooks. Comic reviews.James reviews The Assassination of Darth Vader, Brian Wood’s Free Comic Book Day story, as well as Fire Carrier #4 and Star Wars #5. What do we have here? Why, on the right, could that be a mockup/sketch of the new Star Wars: The Essential Characters that was announced at CVI? Doug Wheatley is doing the interior art for the book, and Erich Schoeneweiss says that is his “very rough and not final” sketch for the cover. Both Del Rey and Dark Horse have Star Wars panels at NYCC this Friday. Del Rey will be revealing one new book (could it be the rumored Matt Stover Imperial Commando title? ), and Dark Horse will have some big announcements as well. Nonfiction. Coverage of The Essential Reader’s Companion isn’t slowing down now that’s it’s out. Author Pablo Hidalgo wrote about what didn’t make the cut, and as well as talking toSuvudu, Jedi News and Jedi Journals. Tosche Station’s Brian reviewed the book, and NJOE asks if it’s right for you. If you have to ask…? As for the books’ much talked-about art, Chris Trevas talked to Lightsaber Rattling, while Darren Tan and Chris Scalf have posted some on their DeviantArts, including Tan’s Allegiance piece above. Star Wars Reads. Well, hopefully you have a good idea of what you’re doing tomorrow, but for today, the chat at GoodReads is on. Of particular interest may be Randy Stradley addressing continuity concerns people have been bringing up for Brian Wood’s Star Wars. Jason Fry, Ryder Windham, Jeffrey Brown and Timothy Zahn have answered fan questions so far. And on the Star Wars blog, Fry weighs in on his first Star Wars book. Bundles. In a related matter, the two Essential Novel eBook bundles (10 for $63, and 4 for $8) are on sale now. And it looks like that’s not the last bundle we have coming: Knights Archive noticed a listing for Drew Karpyshyn’s The Darth Bane series, and it’s now live in the Random House catalog. The eBook bundle will be on sale November 5th for $18.99. Art books. J.W. Rinzler blogged a bit about the release of Star Wars Art: Illustration, revealing that there are two more books coming in the series. 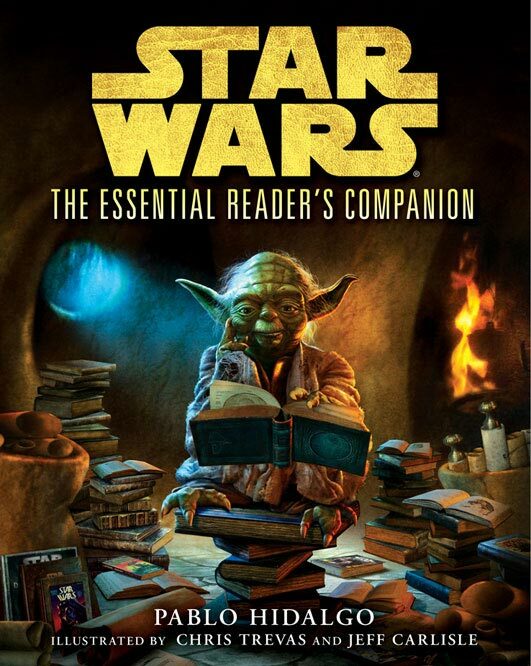 Coming Tuesday – and probably already on the way if you preordered one – will be Pablo Hidalgo’s Essential Reader’s Companion, perhaps the most anticipated Star Wars reference book of the year – or at least since Celebration VI. Pablo did interviews last week with FangirlBlog and Roqoo Depot for the occasion, while io9 featured some of the book’s art. And speaking of art, you’ll also want to keep your eyes open for Star Wars Art: Illustration. Unlike Visions it contains a good amount of art that we’ve already seen, but since when has that stopped anyone from buying an art book? Meanwhile, coming to comic shops on Wednesday is the second Clone Wars omnibus, The Enemy on all Sides, which collects collects Republic #54–#66 and #68, Jedi: Yoda, and General Grievous #1–#4. You may also find a second printing of the Rise of the Sith omnibus, which collects comics that lead into The Phantom Menace. The blogside. Tor’s Emily Asher-Perrin takes a look at ‘the true nature of the force,’ addressing a lot of the weird and complicated issues at hand with ‘balance’ and all the rest of the simple tricks and nonsense scattered throughout fandom. Costuming. Trisha Barr interviews Shea Standefer about her great Jaina Solo costumes at CVI. Bria wrote about gender-swapped costumes, including a crossplay Wraith Squadron she took part in at D*C. And, on that note, more Expanded Universe costumes from D*C.
Interviews. John Ostrander talks about the next arc of Agent of the Empire at CBR; Roqoo Depot caught up with Timothy Zahn, James Luceno, and Troy Denning at Celebration. Audio Random House Audio has a poll up on Facebook asking which of three books – Miller’s Knight Errant, Reaves/Perry’s Death Star or Zahn’s Allegiance – you want to hear on audio first. Announced less than an hour ago here in Orlando was a new Essential Guide to Characters for next year by Daniel Wallace. Now, that wasn’t exactly a secret: We reported on it way back in April 2011. So what was the news? That Doug Wheatley will be doing all the portraits for it, 150 in all. Look for it next July. There was other news, of course: Check it out beneath the cut. Oh, and apparently The Clone Wars is moving to a Saturday morning debut? Alrighty then. Bryan Young went to the S5 premiere tonight and has posted a review and recap. Some quick thoughts on Del Rey, Detours, cupcakes, the Essential Reader’s Companion, Mark Hamill and more below the cut.